Have you ever tasted something for the first time and thought “oh my gosh this is AMAZING!” then crave it the next week? This was me when I first tried this recipe. I actually made it three times in three weeks that is how good I thought it was. I feel sorry for the eggplant. It either is said to taste like dirt, or it is breaded and fried and served with a red sauce. I don’t think eggplant tastes like dirt –however I will say that it does have an earthy flavor to it, and to be honest I have never had eggplant parmigiana. Maybe I should use the cute little eggplant sitting on my counter and try eggplant parmigiana a for the first time. When I bought my first eggplant I wanted to use it in a way that wasn’t breaded and fried. Shaheen from The Purple Foodie came to the rescue. She had just posted a recipe for stuffed eggplant, after reading the recipe I knew that I had to try it. I have recommended this recipe to several people. Please try it just once, it will change your opinion of eggplant. 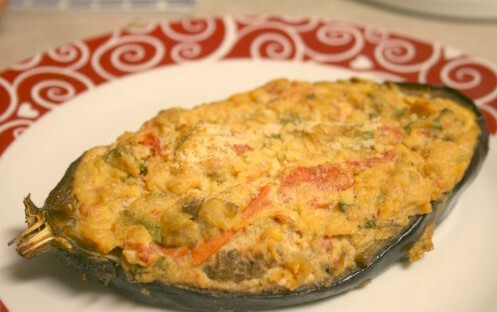 Cut eggplant in half, placing in baking dish with cut side up. Drizzle with olive oil and season with salt & pepper. Bake for 20-30 minutes. You want the eggplant to be tender (so you can scoop it out). Remove from oven. Lower oven to 375 degrees F. Leave eggplant skins in baking dish. They will be filled later. Scoop out the tender eggplant and mash with a fork. Set aside. In a skillet heat the olive oil over medium heat. Add coriander, cumin, and garlic. Cook for 2 minutes -stirring often. Don't let the garlic burn. Add tomato, bay leaf, and extra salt & pepper if desired. Cook for another 3-4 minutes stirring often. Add the eggplant flesh and cook for 7 minutes. Remove the bay leaf. Remove from stove. Add the cheeses and cilantro to the eggplant mixture. Once the mixture had cooled slightly stir in the beaten egg. Divide mixture in half, filling each eggplant, drizzle stuffed eggplants with a little olive oil. Place baking dish in 375 degree F oven, and bake for 35 minutes. During last 10 minutes of baking sprinkle on additional Parmesan. ENJOY! Oh man, I can’t wait to try this for Saturday’s brunch! PS. Love the new look. I’m working on that recipe you asked for on FB. Can you remind me via message what that was again?